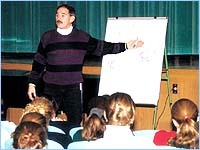 This is the beginning of a page covering Scientology's infiltration of Boston-area schools through their front group, Narconon Drug Education & Prevention. Their local person in the Boston area is Bobby Wiggins, a former heroin addict. Scientology reaches into Schools through Narconon, by Joseph Mallia. The Boston Herald, March 3, 1998. Includes an interview with Bobby Wiggins. Scientology emails praising Bobby Wiggins and his "hat writeup" that teaches Scientologists how to do these drug education lectures, presenting Scientology concepts with a secular face. Drug Education Hat Writeup by Bobby Wiggins (7MB PDF file). This document is rife with Scientology jargon. It offers advice on how to teach Scientology principles to kids, and reminds the would-be lecturer to always thank L. Ron Hubbard at the end. HTML version of the Bobby Wiggins Drug Education Hat Writeup (searchable). The formatting needs work... any volunteers? See this article in The Humanist for more on Narconon in the public schools. And here is a cache of articles about Narconon Drug Education in San Francisco. In October 2004, a task force set up by SFUSD recommended that the Narconon program be banned from San Francisco's schools due to its scientifically inaccurate information and bad methodology.